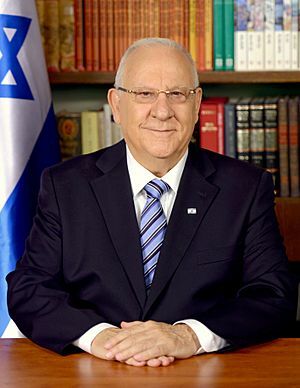 Reuven Rivlin (born 9 September 1939) is the current President of Israel. Rivlin was born in Jerusalem when it was part of British Mandatory Palestine. Before entering politics he was a lawyer. He was elected to the Jerusalem City Council in 1978. Rivlin worked for El Al Airlines serving on the executive council from 1981 to 1986. He was a member of the Knesset, parliament of Israel for many years, elected first in 1988. Rivlin was also speaker of the Knesset and minister of Communications of Israel. On 10th of June 2014 he won elections for the post of President of Israel. Rivlin is married and has four children. Reuven Rivilin with Israel's Presidential Standard. Reuven Rivlin Facts for Kids. Kiddle Encyclopedia.